Only three inches tall, the toadstools only last a few days, but such a delightful sight! A brief glimpse of Fairyland. Sometimes life is far too exciting to get down to any sewing - for instance, when an online quilting friend materialises from the other side of the Atlantic, and she becomes three-dimensional, talks, and even walks. Late last year while exchanging emails with Gwyned she told me that she and her husband Dana were making plans to visit England to walk the Cotswold Way. She hadn't realised how close she would be to where I live. We decided that we couldn't miss the opportunity to meet up, so she emailed me her itinerary so we could make plans. 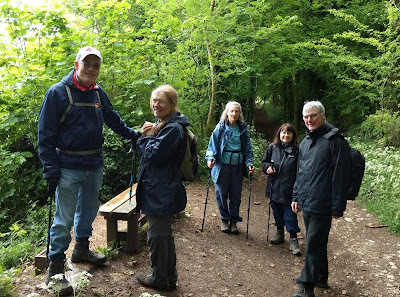 The best day for us was last Saturday, and we arranged to meet at nine o'clock in the morning at her overnight stop, the Falcon Inn at Painswick. 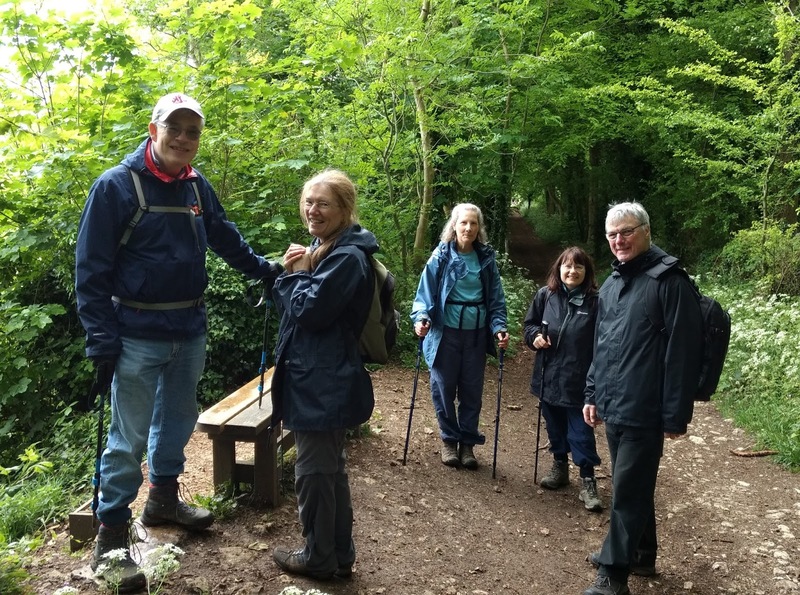 What followed was sheer delight - a walk through beautiful meadows and woods, with views across the landscape, and all the while getting to know each other. At lunchtime we had a rendezvous with Gwyned's brother Nick and his wife Kate, who had driven over from Oxford to join us for the rest of the day's walk. The photo was taken by Dana while we took a pause in the woods - left to right: Nick, me, Gwyned, Kate and my husband Alex. What did we find to talk about? Between us all, plenty, and surprisingly little about sewing and quilting. However, Gwyned did say with some considerable feeling that she couldn't wait to get home and start working with plenty of colour. I got the impression that she was totally greened out. Later on while discussing the ease with which a walk turns into a series of detours, Kate redefined getting lost as free motion walking. Yes, we even did a little bit of that too. Here goes for Week 140. 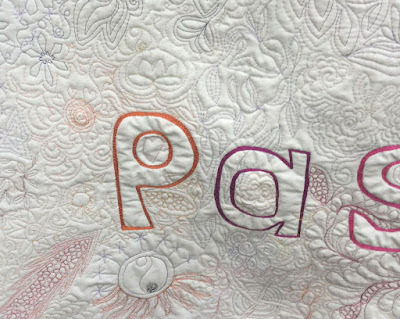 The project that caught my eye in Week 139 was Andrée's Reason and Passion quilt. If you haven't seen her blog post yet, nip over now and have a closer look. Every project produces scraps, and my Mother of the Groom outfit has left me with a pile of quilted offcuts. Today I started putting a few together with the intention of making a cushion cover. It is a bit of a brain teaser, because there are so many awkward shapes and so few straight lines. This project might take a little longer than I anticipated. Here goes for Week 139. The project that caught my eye in Week 138 was Afton's Wonderland Quilt. If you haven't seen her blog post yet, nip over now and have a closer look. You wouldn't want to be a mouse with this owl watching you. He posed nicely on a stump at a display at a country show in County Wicklow, and kept a careful eye on everything going on around him. Expensive isn't my usual look, but for my son's wedding I decided the time had come to enjoy wearing a posh and unique outfit without breaking the bank. Rather than go shopping for clothes, which I find frustrating and terrifying, I opted to invent and make my own. I knew I wanted a jacket and skirt, and did some pattern hacking. Although the mock up jacket I made wanted to overlap and transform itself into a double breasted version, the finished item definitely needed to be single breasted. Only three buttons were required - any more would have been too many. To make life difficult for myself, I started experimenting with silk, with a view to making a quilted jacket. To test how quilted silk would behave when making seams and buttonholes, I made a cushion. Because the wadding is so thin, it was easier to work with than I anticipated. The silk I chose is a blue dupion shot with dark red. The red only really shows at certain angles and depends also on the light, which is why the colour varies in the photos. The red element also influenced the choice of colour for the lining. Once I had bought the silk, the next step was to measure all the pattern pieces and then quilt panels of different sizes. This photo shows the upper section of the back of the jacket. 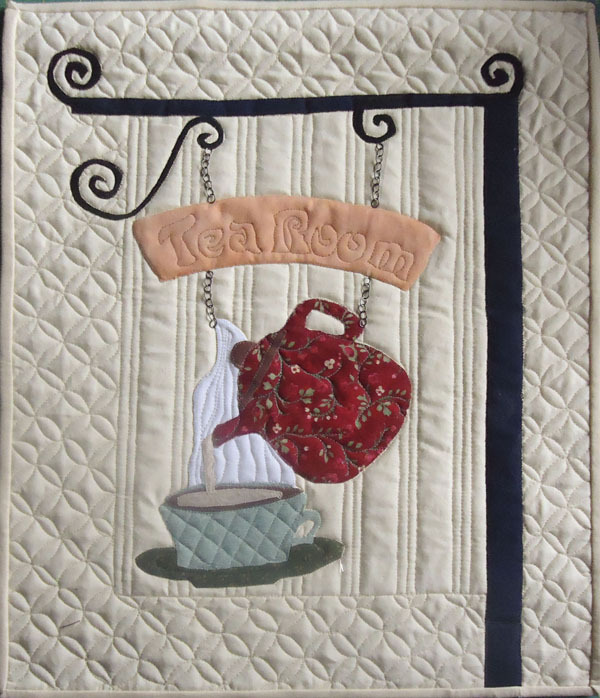 I used the leaves and berries quilting design which I had tested in different coloured threads on the cushion. I went for a thread with minimum contrast so as not to distract from the shot effect of the silk. To cut out the pieces, I drew around them in tailor's chalk on the back. This photo shows two panels - on the left are the front facings and back neck facing, and on the right are the two front panels. These were definitely the scariest pieces, because I had had to learn some pattern drafting. I wanted a shawl collar, but the pattern I had adapted had a stand-up mandarin collar. This is the You tube video that I found easiest to understand because the graphics are so clear. I was pleased with how well the collar folded over into place once it was finished. I am hoping that the back of the jacket looked better on me than it does on the home-made dress form, which has no neck or shoulders. One of the most time consuming jobs was trimming the seam allowances on the inside to reduce bulk. The trickiest bit to trim was where the top and bottom collar pieces meet, because both have a seam at the middle. If you count quilted fabric as three layers, then you have twenty four layers to contend with inside the seam. Ruthless trimming was called for. The hard work with the collar paid off in the end, and I was really pleased with the way the embroidered blouse complemented the quilting. The skirt is plain at the front, with an exceptionally messy hem that looks in need of a good pressing. This is because I had to sew in a ridiculous number of weights to prevent the skirt riding up. I would rather have a less than perfect hem than worry about showing far too much leg for my age. Nobody would have noticed the bumpy hem on the day because I was constantly moving or talking. Rather than have a pleat or straight vent at the back, I made an edge to edge opening with curves echoing the lower front of the jacket. The curve on the jacket just happened to be exactly the same size as one of our plates, so that came in handy when drafting the skirt pattern. Then to add just a slight touch of raciness, I stitched on a large bow. At last I have conquered my fear of zips, and am proud to show my first ever invisible (as opposed to visible) invisible zip. I am rather less proud of the creasing just below the waistband, but I have no idea whether that actually showed on the real me. I don't think anyone noticed or would have cared. The most important thing is that I made sure the waistband wasn't too tight on me and that I had plenty of room for my dinner. While I was making the outfit I often wondered whether I might end up too hot on the day in a quilted jacket. The weather at the end of April can be either glorious or ghastly, and I was preparing for the latter. As it turned out, my instinct was right. When we went into church it was overcast and breezy. When we came out it was blowing a gale. My fascinator went flying, my hairdo made a rapid change from bun to pony tail, my daughter clung onto her skirt for dear life, and plans for photos outside the church were instantly abandoned. But I found it all hilarious because I was warm. I needed all the layers after all. Here goes for Week 138.. Unfortunately nobody linked up with a free motion quilting project last week, so there is no featured project to show this week. Embroidered blouses rarely venture out of my wardrobe, but this was one was the winner when it came to assembling my Mother of the Groom outfit. I have had it for years, and have no recollection of when or where I bought it. It has no manufacturer's label or washing instructions. It was second hand and a bargain, that's all I can remember. It is a lovely shade of ivory, so goes with just about every colour I am likely to wear, and the detail is beautiful. It has appliqué flowers and shadow work leaves, with some raised stitching at the centre of the flowers. The neckline and armholes are edged with closely packed buttonhole stitch. The stitching all appears to have been done by hand. Even the turnings for the buttons and buttonholes down the back, and the buttonholes themselves, are hand stitched. It is such a beautiful blouse, it is a shame that I have only worn it twice. The last time was for my nephew's wedding in 2010. It was slightly annoying to wear because it was far too wide on me and kept coming out my skirt waistband. Despite its delicacy, it is not fitted at all. It is made to fit a cardboard box. This time I decided to do something about it. Rather than take in seams or add waist darts, the simplest solution was to add a belt made of one inch satin ribbon at the back. It was easy to insert the ends inside the French seams at the side, and then I had the challenge of using the buttonholer on the ribbon. The ribbon slipped around a bit, but I managed to get away with it. Had this not been a last minute job I would have made the belt meet in the middle, but I can live with asymmetry. It's artistic. Here is the blouse modelled by my fake daughter. It was a tussle dressing her, and I couldn't make a decent job of tucking the blouse in, but on the day it was just the ticket. Not quite seasonal, but I like the colours. Irish bride, English groom, married at last and looking so perfect together! My son Alastair and lovely Leah walked down the aisle last Saturday. Being Mother of the Groom has to be a whole lot easier than being Mother of the Bride, but there were a few little details to help out with. Ally could cope with the cufflinks, but he didn't have any quilt pins on him to keep his buttonhole secure. The wedding was at Holy Rosary Church at Greystones in County Wicklow. Not only was this a match made in Heaven, but the colour matching was the work of Heaven too. It wasn't until about a fortnight before the wedding that I found out that Ally, the Best Man and Groomsmen would be wearing blue, and the day before the wedding that Leah's mum Evelyn would be in blue too. The reception afterwards was at Tinakilly House. It was a lively affair. Spontaneous dancing around the tables broke out between the main course and dessert. My brother took this mini video of the fiddler visiting the table next to his. During the speeches Evelyn and I were both presented with massive bouquets - easy for Evelyn to take home, but mine had to wait three days before a trip on the ferry back to England. I now have a rustic display of Canterbury bells, roses and greenery in the front window. I gave Ally and Leah their quilt the day before the wedding. This picture was taken back in February at our house. I was delighted to find that the colours went far better in their house than in ours. Perhaps one day I shall take some artier pictures, but for the time being these shall have to do. The quilt is made up of eleven panels using the quilt as you go method, with batik joining strips. The larger pieces of fabric in the top are all Oakshott shot cottons, combining the discontinued hand-woven stripes with machine-woven plain colours. Every panel features either oak leaves (for England) or shamrock leaves, and I featured some photos of the details of the quilting on demonstration videos - berries, Jacobean leaves, and honeysuckle. A design I used for the first time was poppy heads, which I shall find an excuse to use again as soon as possible. The red fabric at the centre of the quilt features quilted rudbeckias, one of my favourite designs. 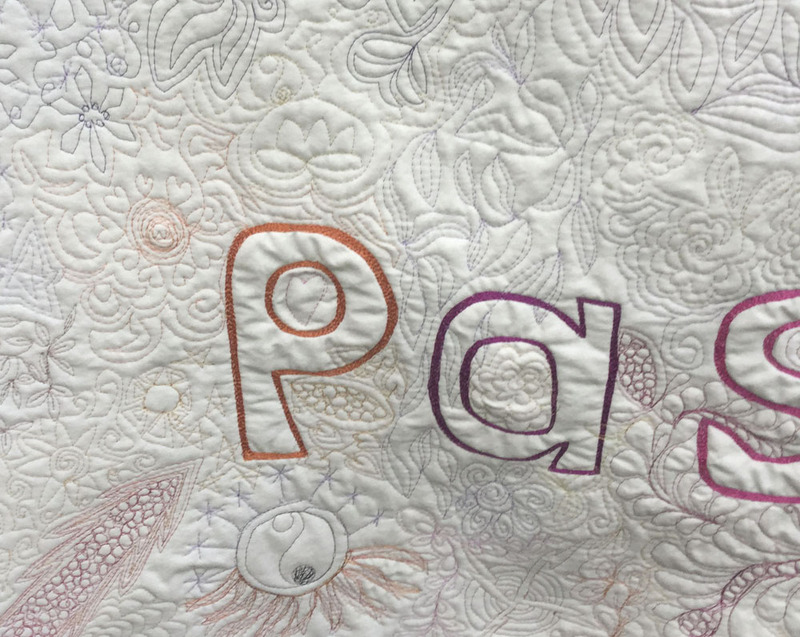 The strips of small printed cotton squares serve a dual purpose - a guide for keeping the quilting even, and a bit of colour and gratuitous fun. The Union Jacks are there to remind Leah where she found Ally, and the teapots to remind them that morning tea is the key for a happy marriage. All the piecing and joining was done with my 1916 Singer 99K hand machine, and all the quilting with my 1945 Singer 15K treadle. I have heaved a big sigh of relief - Ally and Leah love their quilt. And we all loved their wedding! A big vote of thanks to Bob and Evelyn for their outstanding hospitality and generosity! Here goes for Week 137.. 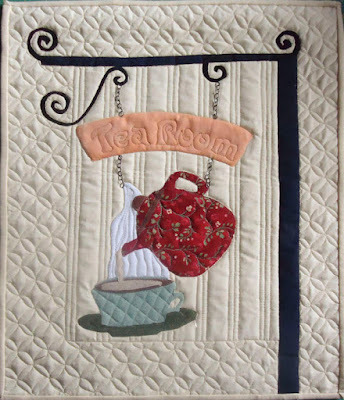 The project that caught my eye in Week 136 was Andrée's tea time quilt. If you haven't seen her blog post yet, nip over now and have a closer look.